I recently discovered the world of video podcasts...(I know, I'm not "up" with the "times" as they say) and have been enjoying the recipe stylings of Mark Bittman, author of one of my "go-to" cookbooks, How to Cook Everything. Bittman is a columnist for the New York Times and shares some of my views on eating and food culture. I enjoy him from time-to-time. So tonight I decided to throw together some fried rice; conveniently, I happened to peruse the podcasts earlier today and saw one Bittman did on fried rice with the influences of a chef I have enjoyed reading through the years, Jean-George Vongerichten. Well, this is my variation on Bittman's variation. I should disclaim up front that unless I am baking, I don't follow recipes and measurements word-for-word (that's why many of my recipes will contain no measurements...they are more of an outline). To me, recipes are inspirations...diving boards. I encourage you to read recipes, ignite your creative juices, and explore the food. 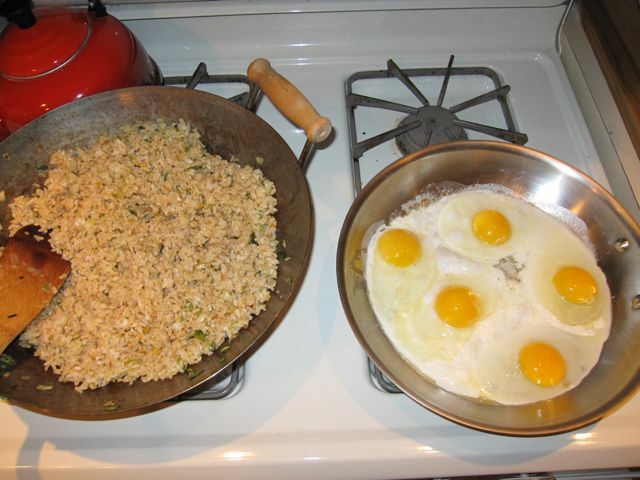 To make the fried rice, you'll need some cooked rice. 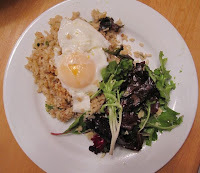 Ideally, you have some leftover brown rice from another meal (and the rice was properly soaked before cooking...look for upcoming posts on that topic). You want your rice to be "dry," not wet from just cooking...or soggy from cooking in too much liquid. The wetter the rice, the mushier it will be when you fry it. So if you like a nice texture with actual rice grain separation, drier rice is the way to go. 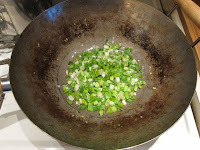 In a pan or wok, saute some minced fresh ginger and garlic in a few spoonfuls of coconut oil...toss in a wee bit of real salt (sea salt, Real Salt, Himalayan, etc). 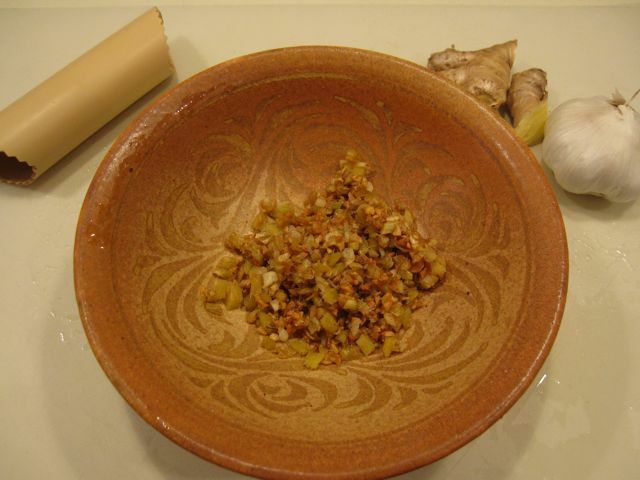 When the ginger and garlic is fragrant and toasty golden brown, remove the bits and leave the oil (the garlic will cook faster than the ginger, so beware the possibility of burning it). 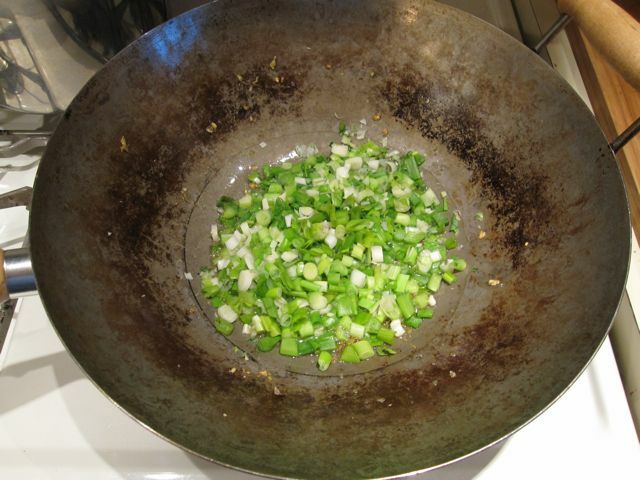 Chop some leeks (or in my case, green onions...that's what I had on hand) and saute them in that wonderfully aromatic oil you left in your wok. When the onions are bright and soft and you can smell the Asian flavors wafting through your kitchen, go ahead and put the cooked rice in your wok and stir about to coat with oil and onions. Fry the rice until you get it to your desired texture (softer, crispier, you decide), then stir in the fried garlic and ginger. To complete the meal, fry or poach some eggs...each person's meal will be a generous portion of the rice with an egg served on top. Finish the dish with a dash of soy sauce (only a properly fermented variety, such as SanJ...probably a future post on that, too. LOL) and some cold-pressed sesame oil if you have some. Serve with a green salad, and Voila! The picture doesn't do the dish justice...but it was scrumptious! And healthy, too, of course...I wouldn't dare share it otherwise! Tasting notes: I had too little garlic/ginger for the amount of rice cooked. Play with the ratios, but cook more garlic/ginger than you think you'll need if you want a robust flavor. Former journalist/editor turned "anti-establishment" health crusader...passionate about natural medicine, pure food, real birth. Community herbalist and nutritional therapist, researcher, midwife-in-training, photographer, gourmet. I don't do business with the FDA...or the AMA, ACOG, etc... I believe in personal health freedom and responsibility...informed CHOICE; never mandates and coercion. Remember, you write the paychecks...they work for you.